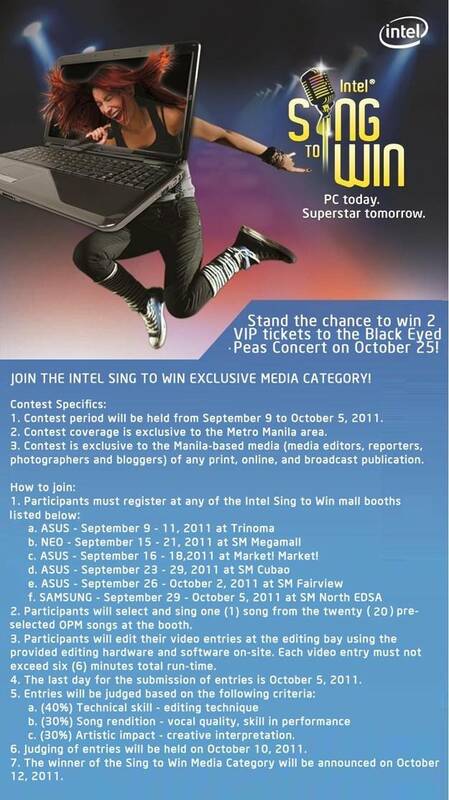 Weng Zaballa: Join Intel Sing to Win Media Contest! Join Intel Sing to Win Media Contest! Catch the last weeks of the Intel Sing to Win Media Contest for a chance to win 2 VIP tickets to the Black Eyed Peas Concert! This is part of Intel’s successful Sign to Win Campaign, a series of nationwide interactive mall shows inviting consumers to showcase their creativity by singing and editing their own music video, is down to its last 2 weeks and we would like to invite YOU to join in on the fun in the special media category! Intel, with the participation of Acer, Asus, Lenovo, Neo and Samsung, will be giving out 2 VIP tickets to the Black Eyed Peas : Live in Manila ! Concert at the SM Mall of Asia Concert Grounds on October 25, 2011 to the best Sing to Win contest entry! Joining is easy! Catch the Sing to Win mall tour at Asus Booth at SM Fairview (Sept 25-Oct 2) or Samsung Booth at SM North EDSA (Sept 25-Oct 5). Record 1 OPM song and edit your video at the on the spot editing bay. Entries will be judged by Intel and winners will be announced on October 12.